Who is Korbinian Holzer? If you don’t know yet, he is a big deal! At 6’3” 205 lb the German born defensive defenseman is making an impact, and people are starting to take notice. The Toronto Maple Leafs drafted Holzer at the 2006 draft in the fourth round with the 111th pick. Holzer continued to play in Germany for the Dusseldorf Metro Stars of the DEL for three seasons. He has also represented Germany internationally for the 06/07 World Junior Championships, the 09/10 and 10/11 IIHF World Championship as well as the 2010 Winter Olympics. 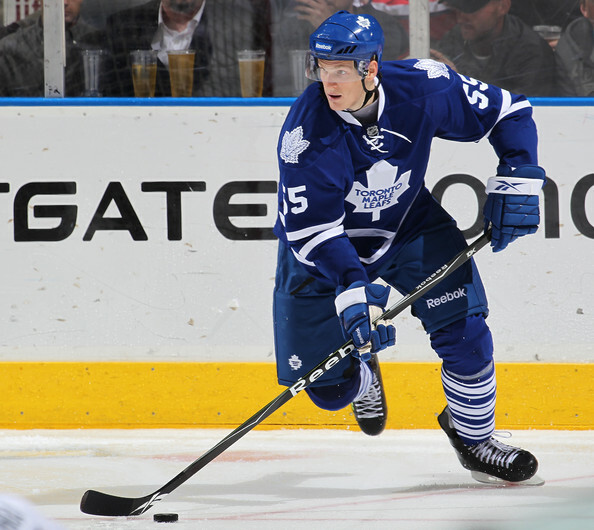 Holzer made his North American debut last year with the Toronto Marlies in the AHL while appearing in two NHL games with the Leafs. Now in his second season with the Marlies, Holzer is playing a prominent role as the teams shut down defender. He often leads the team in minutes played by keeping his game simple and safe. Holzer provides plenty of physicality, and has puck-moving abilities. He has added more strength to his game since being drafted, and refined the details of his game. Holzer is now 23 years old and poised to establish himself in the NHL. Buried down the depth chart in Toronto behind Dion Phaneuf, Luke Schenn, John-Michael Lilies, Mike Komisarek, Jake Gardiner, Cody Franson, Keith Aulie, and Carl Gunnarsson have kept him with the Marlies playing top minutes in the AHL. As the NHL trade deadline approaches, there is plenty of speculation that Leafs General Manager Brian Burke may move a defenseman or two in a deal that would allow him to add Holzer to the Leafs roster. Another possibility is Holzer is included in a package and traded away. Ironically, Holzer fits the description of what the Leafs would be looking for in a defender. He is solid in his own end, big, tough, kills penalties and shuts down the opposition. Holzer has rapidly climbed up the Leafs depth chart, and the 23 year old prospect not only has the attention of Leafs Managers and Coach’s, but that of the entire hockey world. Holzer is ready to trade in a bus ride to Peoria, for a cab ride to the Air Canada Center. Posted by pharling at 2:14 p.m.